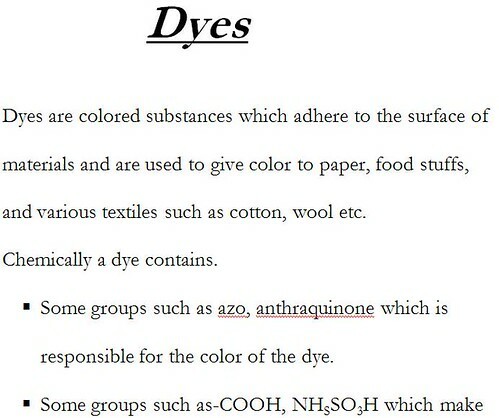 Dyes are colored substances which adhere to the surface of materials and are used to give color to paper, food stuffs, and various textiles such as cotton, wool etc. Some groups such as azo, anthraquinone which is responsible for the color of the dye. Some groups such as-COOH, NHSSO3H which make the dye stick to the fabric by formation of some salt. The dye fabrics appear to be colored because a particular dye absorbs radiation of some specific wave lengths from the visible region of electromagnetic radiation that fall on its surface. The remaining radiations of light are reflected. For example. If a dye absorbs the light in the wavelength region. Corresponding to red, then it would appear green which is the complementary color or red. Funnel, distilled water, filter paper, mortar. White, sodium carbonate, lead nitrate, lead chromate. Light green, copper sulphate, sodium hydrogen carbonate. Oxford blue, phthalic anhydride, urea hydrated copper (II) chloride, ammonium or sodium molybdate. Yellow, Potassium chromate, lead nitrate. Do check for balanced equations & get the project signed by your chemistry teacher.